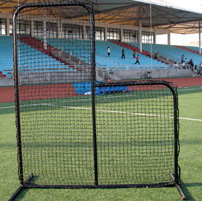 Our baseball protector nets and frames feature 1 1/2" diameter tubing; a push pin design for easy assembly, vertical braces for stability,with black powder coated finish. #36 Black Poly netting(189 lb. tensile strength) which does not absorb water, doesn't fade, and virtually no sag. GREAT FOR TRAVEL TEAMS! Designed to protect the pitcher while praticing. Also great protection for anyone operating a pitching machine. Frames are made with 1 1/2" Diameter Tubing. Black powder coated finish with push-pin design for easy assembly. 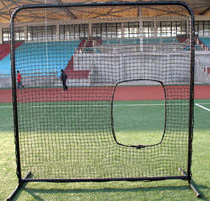 L-Screen Frame has a vertical brace for added strength. #36 Black 1 7/8" Mesh Poly, (189 lb. tensile strength) constructed Pillow Case style for double strength. Designed to protect players during batting practice, staged at the bases. 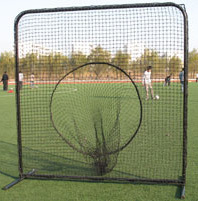 Can be used as a portable backyard backstop, or inside of a batting cage at either end. Frames are made with 1 1/2" Diameter Tubing. Black powder coated finish with push-pin design for easy assembly. #36 Black Poly 1 7/8" Mesh Netting, constructed Pillow Case Style for double strength. Designed for improving pitcher accuracy in the strike zone. Frames are made of 1 1/2" Diameter tubing. Black powder coated finish with push-pin design for easy assembly. 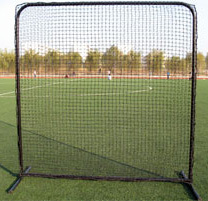 Netting is a heavy duty #36 Black 1 7/8" Mesh HDPE with a 36" Diameter opening for sock. Designed for protection when pitching softballs. Frames are made with 1 1/2" Diameter tubing. Black Powder coated finish with push-pin design for easy assembly. Net is a heavy duty #36 Black 1 7/8" Mesh HDPE netting for double strength and has a 18" x 32" opening.